If you are searching for a perfect way to protect your site from the entry of unauthorised vehicles or to ensure that a pedestrian zone is used only by pedestrians at certain times of the day, then automatic bollards are a solution worth further investigation. Both functional and manageable, our automatic bollards can be designed to meet the technical and aesthetic standards that you need in order to provide the right level of security for your environment. Their robust construction and reliable operation make our automatic bollards the most effective way to provide access control and allow pedestrian access. PAS68 rated and Anti Terror Bollards are also available from Auto Mate Systems. Automatic bollards can be manufactured from either mild steel or powder coated to any colour or finish with stainless steel. Their design incorporates either a heavy duty hydraulic power pack or a very quiet pneumatic power unit. The power units are capable of lowering or raising the bollards more than 100 times a day in less than 4 seconds. Our PAS68 rated bollards are highly resistant and can stop vehicles of up to 15 tons travelling at a pace of 44 mph; sufficient to prevent the strongest malicious intent from being carried out successfully. Our anti-terror bollard has the facility to be fitted with an emergency hydraulic booster unit to allow the bollard to be fully raised in 0.8 seconds in the event of a serious imminent attack. Our wealth of experience in installing automatic bollards allows us to install them with minimal disruption to your site. We can interface the bollards with any existing access control, or provide a new system for you to use. For example, the bollards can be operated via radio fobs, proximity cards, GSM Access, Push Button Control or from a central location. Automatic bollards from Auto Mate Systems Limited are both functionally, and, aesthetically pleasing. Fixed, removable or retractable variations can also be specified to suit the specific requirements, when installed alongside an automated/hydraulic system – unfortunately we do not sell fixed bollards separately. Auto Mate Systems Limited can provide you with automatic bollards that are strong, exceptionally resistant to impact and are safe from performance failure in their retracted state, as well as extended positions. 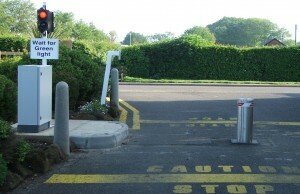 We supply rising bollards that can be controlled easily and quickly for high security conditions. Automated bollards can also be supplied with in-built lights for superior visibility and to indicate their presence at night . In some cases they may also be connected to a fire alarm system so that when there is a fire they can lower automatically to allow vehicles to leave as quickly as possible. They can be designed in different colours and sizes to match their surroundings and can also differ in diameter and rising height according to your safety needs. If you are interested in discussing your specific requirements further, please do not hesitate to contact us for an individual quotation on how to make your property safe with a minimum effort on your part. See our anti-terror and anti-crime bollard range here. Supply and installation of a fully operational and integrated automatic bollard system.